POOP-D-ZOLVER almost instantly removes bird poop by enzyme-producing non-pathogenic bacteria to naturally “digest” the poop in the cage/aviary and also works on carpets, upholstery and fabric. The enzymatic properties naturally eliminate smells. Your new companion needs a good home, or maybe they are growing and need a bigger home. Bird paradise has bird cages for every bird. Make a happy home. 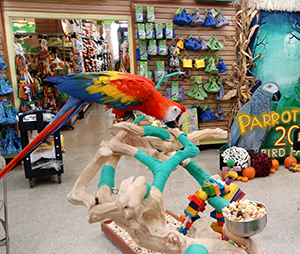 Bird Paradise is a family owned and operated exotic bird specialty store with over 30 years in business. 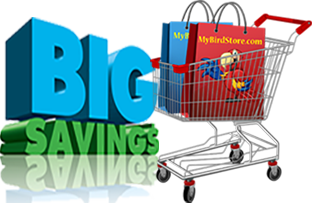 Our 20,000 square foot store stocks over 20,000 toys, 150 bulk food items, 10,000 cages, supplies and a large selection of healthy, hand fed baby birds. We pride ourselves on the personal service and proper education of which these feathered companions are so deserving. Our smaller birds (bourkes, cockatiels, conures, lovebirds, linnes, parrotlets) are batch tested for Polyoma, Psittacosis, Beak & Feather, and PDD. All medium and large parrots are individually tested for the aforementioned diseases, with files kept on each bird and their respective test results. All boarding birds require test results for your peace of mind, as well as that of Bird Paradise. Our staff of avian experts are ready to assist you with finding the appropriate baby to join your family. 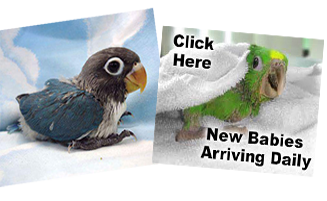 Here at Bird Paradise, we help you select a companion bird that fits your household. We take the time to guide you through your decision, ensuring that bird and owner are a good match. The staff at Bird Paradise knows birds and we are here to help and answer all your questions. We have the World's Best parrot food. Our blends are customized and carefully formulated with the highest quality, healthy ingredients. Check out our coupon page by clicking here to find savings on the things your bird will like. Come back here and see news about keeping your bird healthy. Tips on caring for your bird. 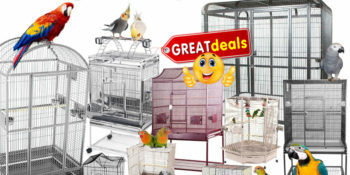 Here are the lowest prices on quality pet bird products. 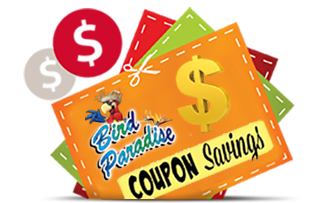 Shop at Bird Paradise for low prices and a fun family day. Bird Paradise has the largest selection of exotic birds. 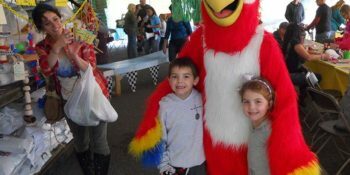 Parrot Palooza 2020 is coming!